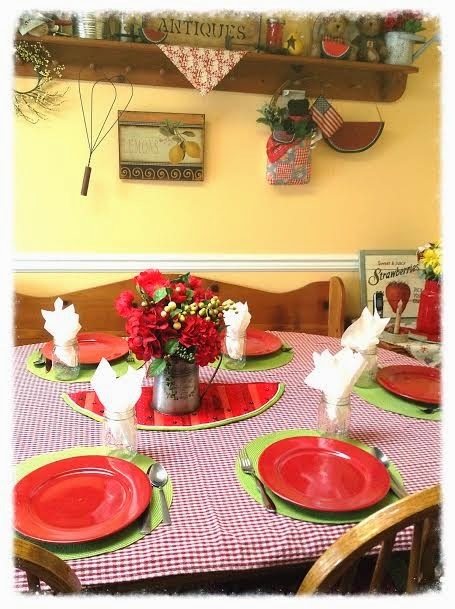 As I set my table the other night for company we were having for dinner...I realized how much I love my home. I of course love it more... when it is clean and full of people that I love also. Oh how I wish each one of you dear friends, could come and visit, and have dinner, and share our home and our story. Of course I guess that is what I do each night when I write in this blog isn't it? My home looks a lot like my Grandmother Johnny's home ( I think I have shared that before ), it was my safe place! Last night we babysat the girls while Mom and Dad their Date Night. I think you can't find a happier place on earth than our home with our Grandchildren in it! Then Jenny and Angie got to do a sleep over!!! After putting on jammies, brushing teeth, and scripture and prayers, it was time for Nana to get in bed with them and tell stories that I make up. They all start like this..." Once upon a time there lived a Nana and her Granddaughters..."
As I kissed them goodnight and told them how much I loved them. I realized this...this is what life is all about! And I am grateful to be healthy again to be able to have these incredible moments with my family!